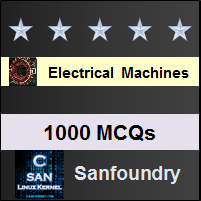 This set of Electrical Machines Multiple Choice Questions & Answers (MCQs) focuses on “Flux and MMF Phasors in Synchronous Machines”. 1. A 3 phase synchronous machine is _________ excited machine. Explanation: The 3 phase synchronous machine has two excitations. Ac excitation at armature while dc excitation at field winding. Explanation: Field is always given supply from dc system so it always absorbs power as it is necessary to produce the flux. Explanation: The field winding is placed on the stator as it will carry less current while the ac supply is fed at stator as it will have to carry large amount of current. Explanation: Pilot exciter is dc shunt generator which supplies the field of main winding. Explanation: The conventional dc exciters have all the above mentioned losses which make them out dated and least efficient. Explanation: SCRs are used in the rectifier configuration as a static system for excitation for dc field winding. Explanation: As the excitation energy is directly taken from alternator terminals, excitation voltage is directly proportional to speed. Explanation: The brushless excitation involves a brushless permanent motor which acts as an auxiliary exciter. Explanation: The main exciter used in DC excitation is field on stator. Explanation: When the dc excitation is disconnected from the supply, it will start acting as synchronous motor as the prime mover will still be mechanically coupled.